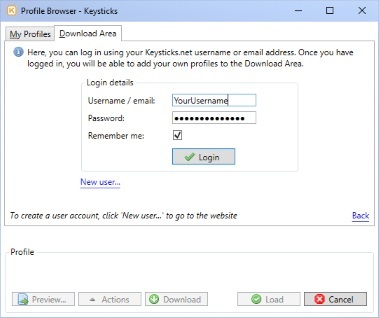 To be able to share profiles that you have created or modified, you first need to log in to the Download Area using your Keysticks.net forum username. You can choose "Remember me" so that you don't have to login in every time you use Keysticks. For your security, Keysticks encrypts passwords so they aren't stored or transmitted as readable text. Once you are logged in, to add a profile to the Download Area, right click it and choose "Share". Alternatively, click the "Actions" button and choose "Share". Keysticks will ask you to confirm that you want to upload a copy to the Download Area. When you share a profile, it will appear in the Download Area's list of profiles with a new reference number (e.g. P20) and your username in the "Added By" column. You don't have to add the reference number to the profile's name yourself, Keysticks will automatically rename it for you as needed e.g. "Example game" --> "P20 - Example game". After you have shared your profile, other Keysticks users will be able to download, use, and like your profile. If you make any changes or improvements, you can just share your profile again to update the online version in the Download Area. You don't need to share the new version with a new name. You can only update your own profiles. You can modify someone else's profile and share it, but it will be given its own reference number in the Download Area. If you have customised the controller background image in the Inputs tab of the Profile Designer, note that the image isn't stored in the profile file, so other users won't see your custom background when you share it. For this reason, you may wish to set the background to the default image or to a plain colour before sharing your profile. Don't try to imply that your profiles are "official", or endorsed by Keysticks.net or any game or application developer. Don't share any abusive, vulgar, obscene, hateful, slanderous, threatening, or sexually-oriented material, or material that may violate any applicable laws. 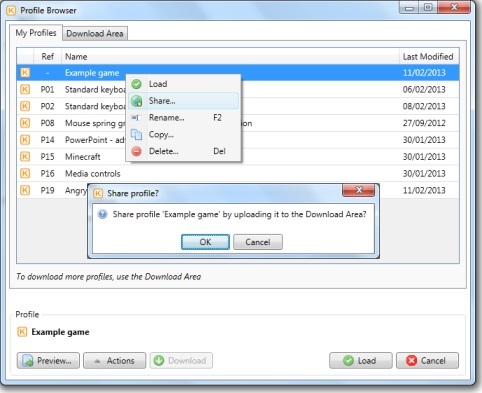 Remember also that Keysticks is powerful software, so it's recommended that you always preview profiles that you download to check that the controls are safe to use. Having said that, Keysticks also has a number of features to guard against potentially harmful profiles. Keysticks.net reserves the right to block users or delete shared profiles, though we hope that won't ever be necessary.